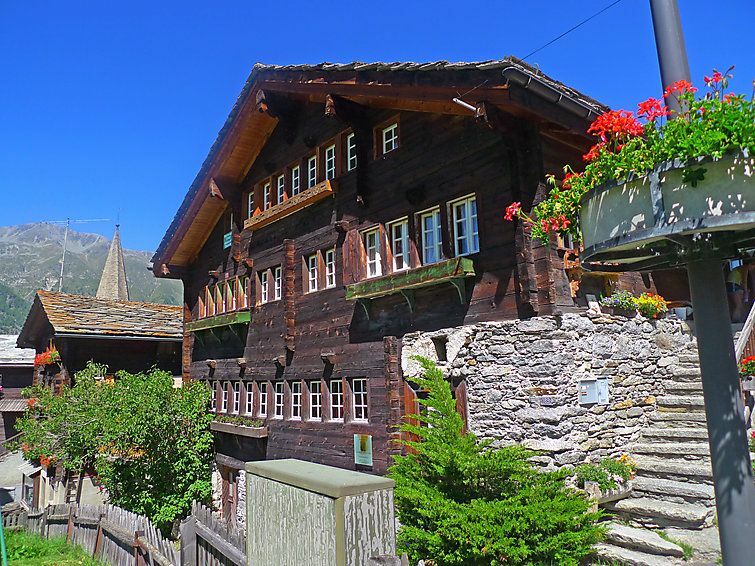 Rustic, historical chalet "this property", renovated in 1997. In the resort, in a central, quiet, sunny position, 200 m from the skiing area. For shared use: table tennis, children's playground. In the house: storage room for skis. Motor access to 200 m from the house. Public car park at 200 m. Shop, grocery 30 m, restaurant, bus stop 50 m. Chair lift, skisport facilities, slopes 200 m, ski rental 100 m, ski school 50 m, ice field 500 m. Please note: car-free holiday complex. 4-room apartment 85 m2, on the top floor. Comfortable and cosy furnishings: living/dining room with satellite TV (flat screen), radio and hi-fi system. 1 double bedroom with sloping ceilings with 1 double bed. Exit to the balcony, north facing position. 1 room with sloping ceilings with 2 beds. 1 room with sloping ceilings with 1 bed. Open kitchen (oven, dishwasher, 4 ceramic glass hob hotplates) with dining table. Bath/WC. Electric heating, boiler (250 litres). Patio. Terrace furniture. Beautiful view of the mountains, the countryside and the resort. 1 pet/ dog allowed.